The Federation seems to have built a utopian society. How is it that they succeeded where so many generations have failed? And how does technology such as the replicator affect our ability to achieve utopia? In this episode of The Briar Patch, hosts Patrick Devlin and Guinevere Liberty Nell discuss the ways in which the Federation has achieved utopian ideals and the role scarcity place in reaching that goal. Borg Collectivism vs. Individualism. We discuss whether the Borg is truly a single mind as presented on TNG or if the Queen shown in First Contact and Voyager is an individual controlling it all. The Ferengi. We discuss Star Trek’s entreprenuers and why—despite knowing that they are swindlers—people continue to do business with them. The Evolution of Society and Culture. We look at how Star Trek addresses contact between cultures and who should have input on how a given society should evolve. Voyager Essentials. 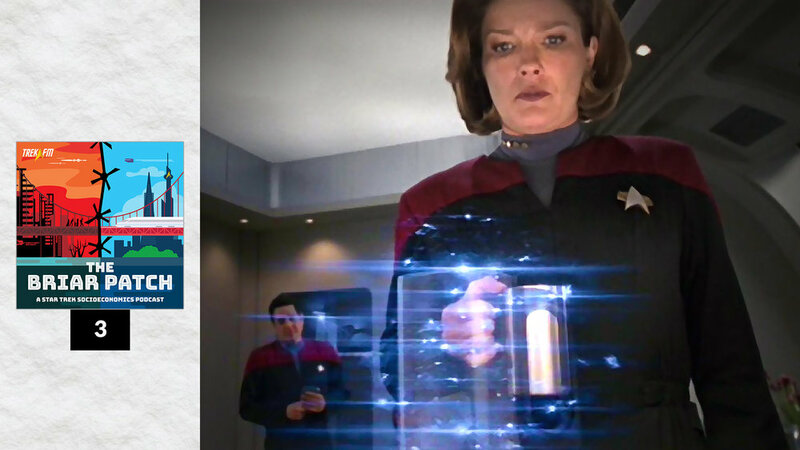 We discuss the seventh season of Voyager in terms of essential socioeconomics, covering key principles and the episodes that best tackle them. Critical Care. We discuss the system portrayed in the seventh-season Voyager episode and how social status can determine access to medical care. Scarcity and Federation Utopia. How is it that the Federation succeeded where so many generations have failed? We explore the role played by scarcity. The Briar Patch 2: How Far Back Do You Want to Go? Insurrection and Forced Migration. While some see the forcible relocation of a people as just, others disagree. We discuss how the non-aggression principle and Marxism factor in to the story of the Ba’ku and Son’a. Introduction. To kick off our new show, hosts Patrick Devlin and Guinevere Liberty Nell share their background, why they got into Star Trek and social sciences, and offer a taste of The Briar Patch.